Has it ever happen to you? A class that you enjoy and find interesting but you still can’t do good in it? Well, that happens to me all the time. Social Studies and Science. I never do good in these class no matter how hard I try! My mom always tell me “You are probably not studying it right” well… I think she’s right. 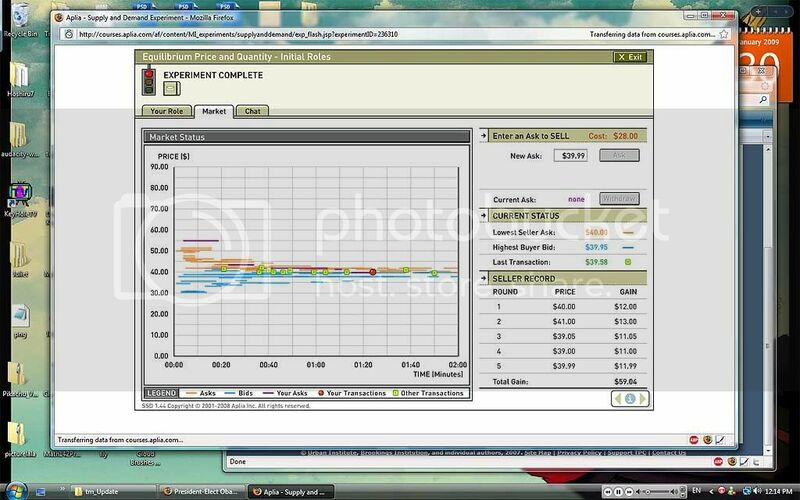 Today we had an online class experiment in our Microeconomics class. It was a ton of fun! In the first experiment we had to play as a buyer or seller. And we get a price value for each role. The first role I got was a seller with a price value of $28.00. It’s low, which mean I can make a lot of profit. And I did! lol In the end I made $59.04 profit. Woohooo! Here’s a link of what the experiment looked like. I didn’t do as well as a buyer though. It was kinda harder as a buyer. The 2nd experiment we had price floors and ceilings!! When I was a buyer in the 2nd experiment my value was $51 and the price floor was $50. Which means the most profit I could have made was $1.00 DX what the heck! Well, in the end I made the most profit I could… $5.00. Haha It was fun anyway. Sorry this blog entry is kinda o_O Confusing, random and maybe boring. Oh well! Happy weekend!